About six years back my father was diagnosed with cancer; it came out of the blue. One of the things I did in the weeks that followed was buy a new DSLR camera. Life had been busy and I realized that along the way we had forgotten to take many family pictures. I wanted to make up for it, being extremely close to my Dad. Encouraged by him, I had learned photography as a kid and now I realized digital cameras were much the same as film cameras. Fast and slow film had given way to ISO settings; shutter speeds and apertures worked the same way. Dark rooms were irrelevant and there was now more scope to color correct and enhance pictures and footage. Editing photos and video was easier because computers were faster and cheaper. In a few months, I discussed this with Dad and he was all for it. Then I started reading everything about filmmaking, watching videos and simultaneously working on screenplays. To understand an actor's point of view, I also did an acting course at Roshan Taneja Acting School where many Bollywood actors like Ranbir Kapoor and Hrithik Roshan had trained. My Dad meanwhile wrote extensively while fighting cancer. Almost every day, we would meet for coffee in the evenings and bounce ideas off each other. He wrote three books and published them over the five years thereafter until we lost him in October 2017. Along the way I wrote several screenplays myself which I'm now turning into films. 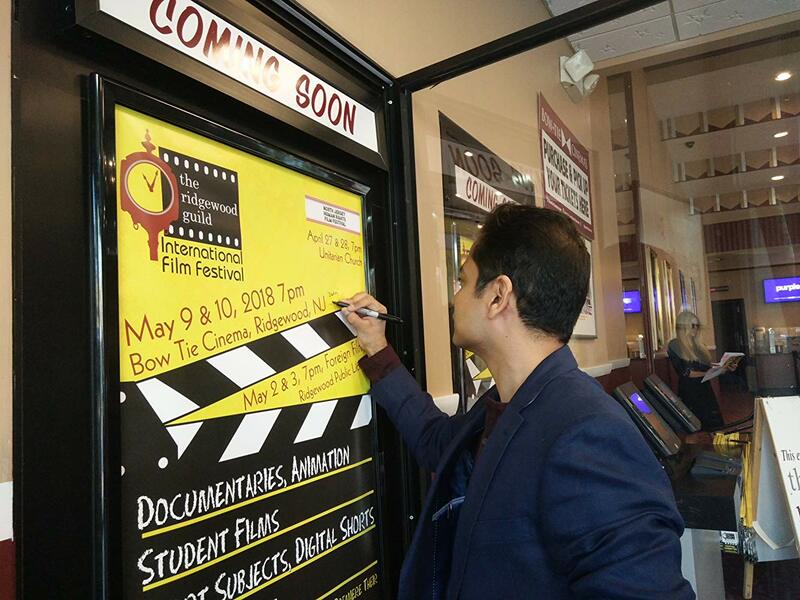 I wrote and directed 'Screwdriver', a liberal satire on bans in India in 2015 which was shown at The Endless Mountains Film Festival, Pennsylvania, USA. 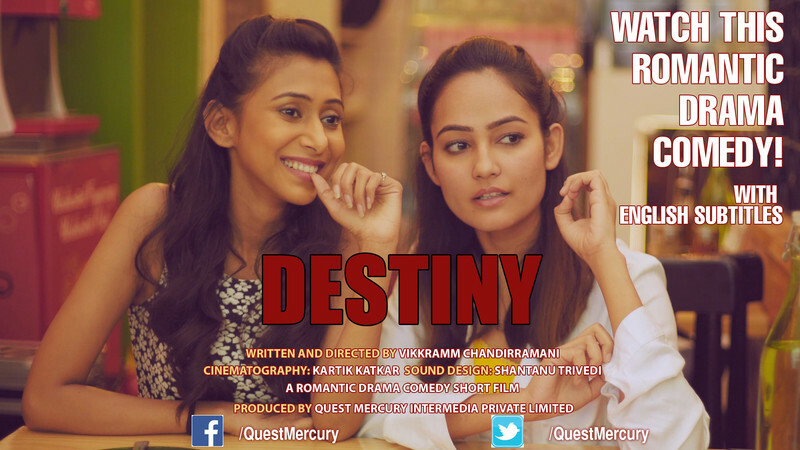 In 2018, I wrote and directed 'Destiny', a romantic drama comedy which has since gone viral on YouTube with 3.7 million views. There have been over 25 festival selections and several awards for 'Destiny' including 'Best Foreign Film' at the 'Ridegwood Guild International Film Festival', NJ, USA and the Mediterranean Film Festival, Italy. It was shown at the Jagran Film Festival, India and at the NCCC Film and Animation Festival, Buffalo, NY where it was a finalist in two categories, drama and comedy. What movies were you exposed to as a child? Did you watch Indian movies? American? What specifically do you remember watching? Vikkramm Chandirramani: In Indian films, I watched the work of various directors from Raj Kapoor, V Shantaram, Guru Dutt and Satyajit Ray to Manmohan Desai, Hrishikesh Mukherjee, Ramesh Sippy and Mukul Anand. I would spend my summer holidays binge-watching films. Among American films, I liked the work of Alfred Hitchcock, Francis Ford Coppola, Stanley Kubrick, Steven Spielberg and James Cameron. I watched a lot of martial arts films which were all the rage in India in my childhood. Romcoms and sitcoms interested me a lot. I binge watched 'Three's Company' once just before my exams! I also especially liked 'When Harry Met Sally', 'Groundhog Day', 'Pretty Woman' and 'Four Weddings and a Funeral'. I also read a lot in my growing up years; literature as well as pulp fiction. Tell me something about Bollywood. How popular is it? Can you give me a quick summary of how it evolved? 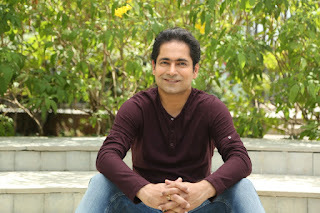 Vikkramm Chandirramani: Bollywood is very popular. Millions of people in India love watching Bollywood cinema. It started somewhere in the early 20th century when Dadasaheb Phalke, widely considered the 'Father of Indian Cinema', made 'Raja Harishchandra', India's first film in 1913. This was the time when Indian cinema was looked down upon. Gandhi considered watching films a vice, on the lines of gambling although self-admittedly, Gandhi himself had never watched a film. This is also why it was heavily taxed, something we bear the brunt of even today. Our first prime minister, Jawaharlal Nehru was not categorically against cinema, but was unhappy with the sort of films being made at that time. Along the way there was gradual acceptance and in 1960 the Film Finance Corporation (later renamed the National Film Development Corporation) was set up by the Indian government. In the post-independence era, a lot of Bollywood filmmakers were making socially relevant films. V Shantaram, Mehboob Khan, Raj Kapoor, B R Chopra and Manoj Kumar made films about patriotism, women's issues, troubles that plagued farmers and how industrialization could lead to unemployment. People would look forward to some films for months before they were released. When K Asif's 'Mughal-E-Azam', one of our most iconic films released, people camped overnight outside cinemas to buy tickets the next morning. In the fifties, Dev Anand, Raj Kapoor and Dilip Kumar ruled the roost and were considered the 'triumvirate'. Among the female actors, Madhubala, Meena Kumari and Nargis dominated the fifties. By the time the sixties came, partition was a somewhat distant memory and people had taken to romantic films in a big way. Rajendra Kumar, Jeetendra, Dharmendra, Manoj Kumar, Shammi Kapoor and Shashi Kapoor ruled the sixties. Among the actresses, Asha Parekh, Sharmila Tagore, Hema Malini and Mumtaz had a large fan following. In 1969, Rajesh Khanna made a powerful impact with 'Aradhana'. He is often described as Bollywood's first superstar. Women went crazy. If his car was parked somewhere, by the time he returned to it, it would be covered with lipstick marks! His era was marked by romantic films with soulful music. It wouldn't last very long though because in 1973, Amitabh Bachchan stormed in with 'Zanjeer', his first success after over a dozen flops. It gave him an 'Angry Young Man' image and changed the trend to action films. Amitabh Bachchan took over Rajesh Khanna's throne and for the rest of the seventies and eighties, he remained the highest paid Bollywood actor. The seventies also saw the emergence of Rishi Kapoor and Vinod Khanna. In the early eighties, Sunny Deol, Jackie Shroff, Sanjay Dutt and Anil Kapoor arrived. Sridevi and Madhuri Dixit also established themselves in the eighties. The late eighties saw Amitabh Bachchan taking a sabbatical and the emergence of the three Khans: Salman Khan, Aamir Khan and Shahrukh Khan, who remain a powerful force even today. Up to the 1970s, cinema was the main source of entertainment and even movies which were re-released did well. In the early eighties, video came along. This was around the time of the 1982 Asian Games. Movies were then made available on video cassettes. The middle class gradually stopped going to cinemas and preferred watching movies on video at home. This brought about a fall in the standards of films being made because many filmmakers started catering to the less educated and prosperous classes. Oversimplified plots in films, sleaze and risqué songs became more common. This changed in 1994 when Rajshree Productions decided not to release on video their much awaited film, 'Hum Aapke Hain Kaun'. Families thronged the cinemas to watch it and it became one of the highest grossing films of all time. This was followed by 'Dilwale Dulhania Le Jayenge'. By the time, 'Kuch Kuch Hota Hai' came three years later; the audience had been enticed back to the cinemas. These two films also marked the debut of Aditya Chopra and Karan Johar respectively; two filmmakers who are extremely influential in Bollywood today and between them, produce several films every year. After the three Khans, the next really big star to make his debut was Hrithik Roshan in the new millennium. Since then we have had Ranbir Kapoor, Ranveer Singh and Varun Dhawan. After the 1991 liberalisation, policies were framed and in the early 2000s, after Bollywood was granted industry status, FDI started coming into the film industry and multiplexes mushroomed in urban cities. The number of cinema screens have increased significantly now, although India lags far behind China when it comes to the screen count. Some movies which may have struggled to be released twenty years back are financially viable at the box office with a limited release today. Women-centric films have also found an audience and are viable, with parts being written specially for A-list female actors. Bollywood films are now being released in more and more countries. China especially has become a major market with some Bollywood films collecting tens of millions of dollars at the Chinese box office. Over the past five years, another major change has been the proliferation of internet access and the availability of OTT apps. YouTube, Twitter and Facebook have made it possible for smaller films to reach an audience . Netflix, Amazon Prime, Hotstar, Zee5, Jio and many others OTT apps have improved the tastes of the audience and made it possible for niche films to find an audience. Many artists who would earlier have found it hard to make a living are now doing well. There are many reasons to believe that the demand for watchable films will increase. It takes minutes or hours to watch a film and months to make one. Besides, it is a creative collaborate process which requires artists to be nurtured. What do you think is responsible for the success of Indian/Bollywood movies? The colors, the dancing, the stories, the actors? Vikkramm Chandirramani: There are various reasons for this. Poetic justice, for one. In a Bollywood film, if there's an antagonist, he's usually going to get punished for his misdeeds at the end of the film. This is very satisfying in a world where we see some of the darkest deeds going unpunished. The antagonist in our films has been changing over the years. There was a time when it was the Shylock-like moneylender in the women-centric blockbuster 'Mother India'. Then there were dacoits in films like the iconic blockbuster 'Sholay'. Post the emergency imposed by Indira Gandhi, the establishment was a villain and Amitabh Bachchan became the 'Angry Young Man' taking them on in several films like 'Deewar' and 'Shahenshah'. Then there were food grain hoarders, smugglers, the drug mafia, terrorists, and rapists, who were villains onscreen at different times. Today with a global wave about women's issues, many films centre around female characters and anyone who gets in their way is a villain. The songs and dance also play a role. There have been instances of some films being extremely successful, largely because of their music. In terms of business, music is a major contributor to revenue. Are movies accessible to everyone in India? Where are they watched most? In theaters, in homes, on devices? 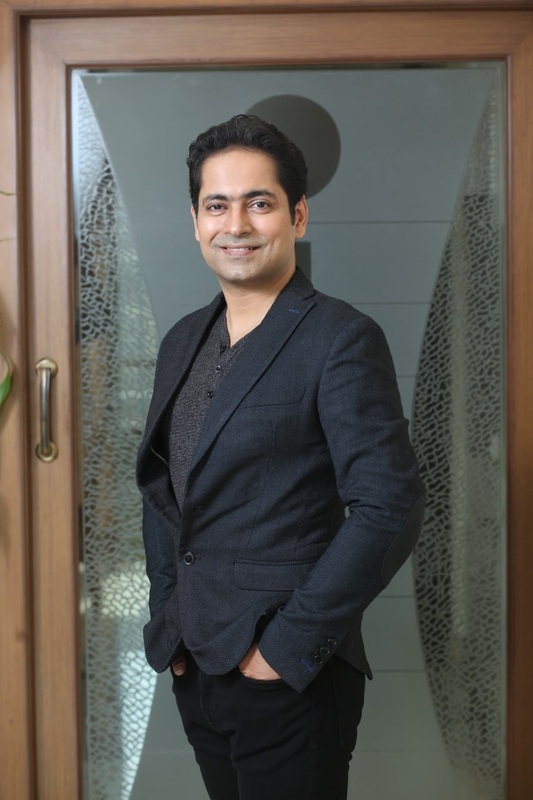 Vikkramm Chandirramani: Watching movies in the theaters is a unique experience. However, viewing habits do seem to be changing gradually. Significant shifts like these happen rarely. Post-liberalization, in the early nineties, when after years of having two state-run TV channels, we suddenly had dozens of TV channels to pick from, many American soaps and sitcoms became popular. Then the multiplexes came up and filmmakers could make films specific to urban audiences. Over the last five years, with internet proliferation, YouTube, Netflix and Amazon Prime, the taste of the audience in India is evolving. Many people in cities binge-watch shows on OTT apps, when commuting or every evening before they end their day. The best part about watching anything online is that if you don't like something, the next video is just a tap away. It's not like you've invested half a day to go to a theater to watch a movie. This is good as well as bad, because while people are open to watching almost anything, it's that much harder to hold their interest. Bore them for a few seconds and they'll tap away to something else! Why are you bringing your movie to American film festivals? What has your experience been like? Vikkramm Chandirramani: As cinema is inherently a visual medium, I ensure my films are as visual as possible. You can switch off the sound on my film and you'll still understand most of it, although there are always English subtitles if you don't. Besides, people across cultures can relate to being rejected in love or having to cope with bans. So, I take my movies to film festivals in various countries including America. It's a delightful way to get feedback. It's also a great opportunity to meet other artists and interesting people who enrich my life in many ways. What are your top 5 movies that you can watch over and over again? Vikkramm Chandirramani: 'The Godfather' is one. It's a great film, with some flawless performances. I read the book in my teens and it's one of the few films that does justice to the book. 'Notting Hill' is the second. Hugh Grant and Julia Roberts are brilliant; it has an excellent script and is very well made! Others are 'Six Days, Seven Nights', 'Castaway' and 'Shawshank Redemption'. 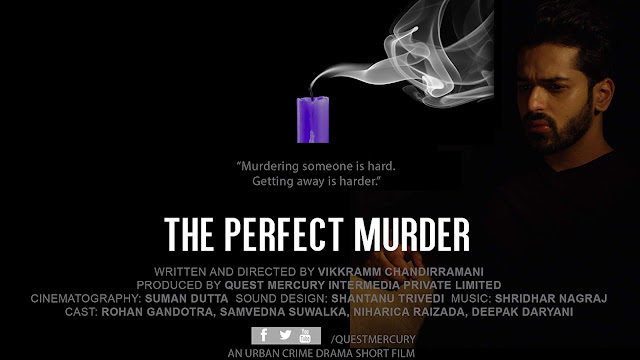 Vikkramm Chandirramani: I've just released my urban crime drama short film, 'The Perfect Murder' on YouTube. I've written, edited, directed and produced it. It has Samvedna Suwalka, Rohan Gandotra, Niharica Raizada and Deepak Daryani in the cast. It is set in Mumbai. We shot it on RED Epic with sync sound and with excellent production values. It's been getting good reviews and the initial response is very favorable. I also have several other scripts including a feature and I'm looking forward to 2019! What is your production process like for your short films? 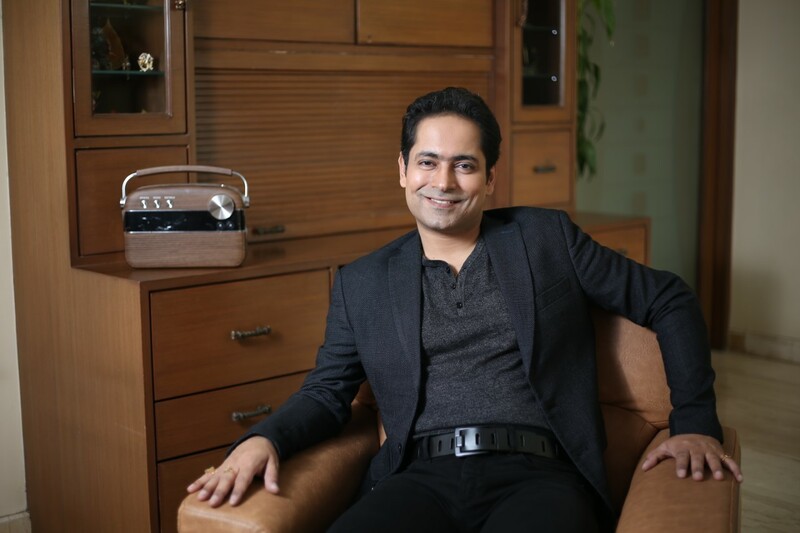 Vikkramm Chandirramani: When I produce, I make every effort to minimize the uncertainties. We don't have line producers and we handle production in house. Since I write myself, as soon as the final draft is ready, I have a fair idea of the resources I will need to make the film. I audition actors personally, call back the promising ones and lock the cast. We then do a reading and go into rehearsals. Meanwhile we do the location recces and start sourcing the props and costumes. I visit the locations with my sound recordist, cinematographer and production design team to assess it technically. Once I'm satisfied with the rehearsals, we lock the locations and shoot dates, finalize all suppliers and then do a look test with the costumes. Before we go on set, we know the shots we're going for on that day and the order in which we will shoot, to minimize set up changes as well as costume changes. The makeup and hair artists get pictures from the look tests and know the schedule so that everyone is on the same page. We make sure we get enough coverage when filming. There are always some unexpected hiccups, but I have a competent crew which gives it their best shot.